You should go back and play Chrono Trigger. Or EarthBound. It’s amazing how well those games still hold up - decades later and the stories told by those RPGs of the mid-90s are still resonant as ever. The gameplay feels little dated, but it’s absolutely incredible how well those games have aged. Filled with rich worlds and interesting characters, creative level and enemy design, I would argue that the JRPGs of the 90s are some of the best examples of how games can be untouched by time - evergreen and waiting for another generation to discover them. Over the years, the JRPG has changed from primarily a storytelling genre to a genre of spectacle. Even games like Persona that still use the turn-based combat synonymous with the genre's roots are dripping in style. The effects are fancier, the music is more complex - and as a trade off, the stories have gotten a bit worse. 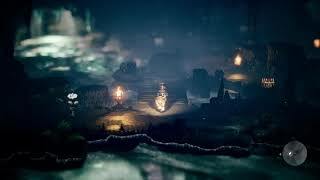 Perhaps it was too much to assume that Octopath Traveler would be able to deliver something similar in quality to those JRPGs of old. Still, with a decrease in spectacle one would assume there would be an increase in substance - that scaling back might allow more focus on characters or world design. To that end, Producers Masashi Takahashi and Tomoya Asano, who have previously headed up the Bravely series at Square Enix, prove that they still have a few creative ideas left when it comes to changing up traditional turn-based combat. But one would have hoped their partnership with Acquire Studios (who might be best known for the Tenchu and Way of the Samurai series, but should be known for their largely underappreciated game Rain on PS3) would have yielded something... well, something more interesting than this. For my money, the biggest sin that a JRPG can commit is being boring and there are large swaths of Octopath Traveler that play out with all of the drama of watching paint dry. The core of the game is pretty good, even if it gets a little repetitive. The turn-based combat has a nice hook with its Boost Point system, which allows characters to save points and act multiple times within one turn. But while the system is fun, it’s not interesting enough, nor presented with enough flair to justify the game’s 60+ hour playtime. But the real issue hamstringing the game is the rote stories that playout with some of the worst characters I’ve seen in a game of this pedigree. Structurally, the game is a mess, failing to build momentum narratively to accompany the growth of characters represented in stats. I watched the eight heroes’ numbers rise, battle after battle, but I never felt any incentive to care about said growth. A big issue is found right in the bones of the narrative and flawed structure of the game. The eight stories are not completely independent - throughout the main game, little details are dropped that hint to events being connected, and after you’ve completed all of the chapters, there’s a more direct connection between the characters that’s revealed. However, the actual blending of these stories in terms of presentation is awful. Each story operates completely separate from every other. Each character gets their own beginning, middle, and end. During cutscenes everything fades away and only the specific character relating to the plot remains. The structure is problematic in two ways. First, it’s an issue because so much time passes between the chapters of each story that every time you’re starting a new chapter for each character, the game has to grind to a halt in order to re-explain the plot. Even if the chapters weren’t so separated, every story beat is so forgettable, it doesn’t trust its audience to remember any of it. Nor should it. The structure is clumsy, but the writing is atrocious. These aren’t even stock characters, these are the absence of characters. They all move through their stories functionally, but none of them are challenged beyond general naivete. Half of them don’t even want something, meaning they’re just aimlessly wandering through the world. But the dialogue is the biggest offender. These don’t sound like conversations between wizards, thieves, and warriors, but more like a couple texting each other about their grocery store list. The dialogue is dry, boring, cliché, repetitive, boring, over-explains everything, and... boring. The only thing that kept me awake during the cutscenes was that I had to press the “A” button to move them along. The second big structural issue is the lack of interaction between characters. JRPG characters are often stock types and filled with tropes, but the games manage to be interesting because you watch those characters bounce off of each other when confronted with interesting scenarios where they both have skin in the game. The plots are always weak, but it’s fun to see what a frog knight says to a cave woman - it’s entertaining to see a leather-fetish, black magic witch interact with a blue, lion-person warrior. The dynamic of the party is half the fun of any RPG. But Octopath Traveler is so busy segmenting up its story bits that there’s hardly any organic chemistry between the party. You can tell the developers realized this all too late as there are little vignettes crammed in, where characters exchange some dialogue, but they’re never sharing a common struggle, just commenting on the action like a passerby. It’s not enough to feel like these characters would care about each other in any way. There are basically two elements to Octopath Traveler, the story and the combat. Luckily, the latter is much better. The combat is mostly made up of random encounters as you traverse the world. The random encounters mechanic feels dated, but it’s relatively harmless. If you’re really annoyed by super weak enemies stopping you, you can always flee a fight - it’s like a ten second inconvenience. When you do get into action, it works pretty well. Each enemy has certain elemental or physical attacks they are weak to (like fire or slashing). Each attack lowers a counter for the enemy, once the counter hits “0”, the enemy “breaks”, meaning they are unconscious for a round and more susceptible to damage. So the goal is trying to determine when to use your Boost Points - do you use them to lower an enemies shield quickly through multiple attacks, or do you use them once you break the enemy and want to up your damage output. That’s solid design, especially for JRPG turn-based combat. And as you progress into the game, characters gain multiple passive skills that will help you even more. For instance, the warrior H’aanit has the ability to randomly do an extra attack when dealing physical damage, and occasionally gets an extra turn at the end of a round, so without spending any Boost Points she might be able to attack four times - if you’re lucky. These multiple systems work well together and it helps that during combat you can see the order of turns for the current round and the next, allowing you to plan accordingly. Do you need to heal your fire dealing character to make sure they’re ready to do maximum damage when you break an enemy, or do you risk it and go for the break that you crucially need? But just as other elements suffer from the game's length, so does the combat. By the fortieth hour, the thrill of the action had all but dried up and I was just going through the motions. Another layer added to all of this is the jobs system. Takahashi and Asano have explored this system thoroughly in the Bravely series and while I appreciated it there, here is mostly feels like window dressing. The jobs system allows you to switch character’s roles, turning them from a scholar to a soldier, thus changing some of their skills. This can be used to great effect to min/max builds for a specific dungeon or boss, but it’s another element that makes the characters feel less like a unit. Instead of swapping characters for their special abilities, you can simply change the job of a character to be what you need. Why bother creating eight unique characters when their defining role isn’t actually unique? It’s not a bad system, it just doesn’t flow with the game, thematically. The job of each character is important, and to make that something interchangeable never sat right with me. The game looks nice. 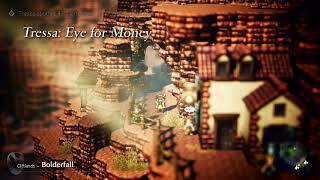 Acquire showed off a unique eye for pixel art in the “What Did I Do to Deserve This, My Lord?“ series, and it continues to exhibit that skill in Octopath Traveler. What is even more impressive is how the game knows when to go big and when to pull back on scale and details. Bosses have large, detailed avatars in combat, but aside from the promotional art, the protagonists are almost always presented as pixelated characters. The backgrounds are the most impressive, they give a nice 2.5D feel and while they can be a little difficult to navigate, they’re a nice blend between the old school look of the golden age JRPG and modern design sensibilities. But, much like the characters, the world design is pretty rote. You have your staples of any RPG world - snow region, mountain region, forest region, etc. And it’s all presented with a familiar middle ages fantasy aesthetic. 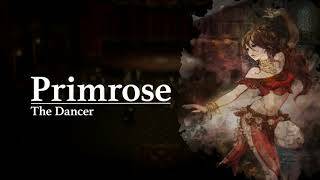 While JRPGs have used this for years, Octopath Traveler seems particularly keen to be as sterile with this concept as possible. Especially after you’ve completed the first chapters and you’re revisiting towns you’ve already been to, the world really loses a lot of its charm. Another casualty of the game’s length is Yasunori Nishiki’s score. The soundtrack itself is excellent with great battle themes and some nice exploration suites. However, the music is stretched so thinly over the countless hours that it loses some of its novelty. Technically, this has been one of my better experiences with the Switch. Maybe I’m getting used to its sensitive sensor, but I didn’t have much issue with the controller. The game boots quickly and autosaves every time it loads in a new area, which is quite generous. On top of all of that, it plays well on the go, smoothly switching between rest mode and throwing you back in the game. That’s mostly business-as-usual for the Switch, but it’s still crazy to me that I can so seamlessly take the console and its games on the go. This flexibility is almost a must-have for something like Octopath Traveler, with so many hours to get through, it’s the kind of game you’ll want to grind out while sitting on the train or killing time at the doctor’s office. Octopath Traveler’s solid combat design is easily the best thing about it. An impressive collection of mechanics layered over a tried-and-true principle. For that reason, it’s impossible to call Octopath Traveler a bad game. But it certainly is a flawed one. The combat is good, but it can’t make up for the horrendously boring stories that are bad down to their very marrow. It can’t compensate for the mismanaged characters that seem about as emotionally connected as strangers on a train - sharing a destination without any organic connection. The world is pretty but dull, competent but safe. And when you’re asked to spend northward of 60 hours with all of these characters, it’s imperative that we actually care about them. It’s clear that Octopath Traveler has intelligent riffs on old-schools mechanics, combat-wise. I just wish it could do anything half as smart with the rest of its composition. The world looks nice and the music is great, but it quickly loses its charm after the thirty hour mark, and that’s not even the halfway point. The turn-based combat is really solid and the multiple mechanics of Boost Points, breaks, and weaknesses work well together. However, it gets a bit dull late on. The characters are about as charming as a block of wood, their stories are dull, and there’s no organic chemistry between the cast. This is a solid technical effort with generous saves and quick loading times. But what’s best is how well the game works on the go. If you’re just here for the combat and don’t mind a bad story, or if you’re looking to soak up the nostalgia of the golden age of the genre for hours on-end, there might be enough here to justify a purchase. It was perhaps too much to expect that Octopath Traveler would compete with the JRPG greats, as sadly it misses the mark in understanding the nuances of what made those titles so iconic.